Explore the beauty of rural Hungary, its towns, people and folk art. Roam the stalactite caves of the Aggtelek cave system in Josvafo. 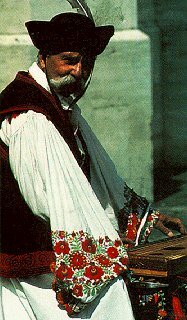 Travel picture of A street musician in Hungarian costume. Please send me further details of Rural Hungarian Holidays.